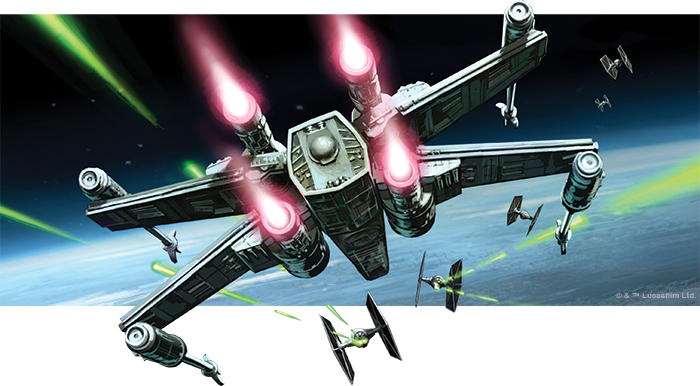 If you could fly any Star Wars starfighter, what would it be? 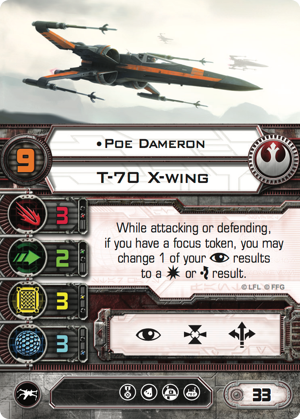 Would you drop yourself into the cockpit of an X-wing and race to battle alongside Luke Skywalker and Poe Dameron ? Would you seize the controls of a TIE fighter or Special Forces TIE and rip through the skies to hear its twin ion engines roar? Or would you take the helm of another pilot's unique signature starship—like Han Solo's Millennium Falcon , Boba Fett's Slave I , or Dengar's Punishing One ? 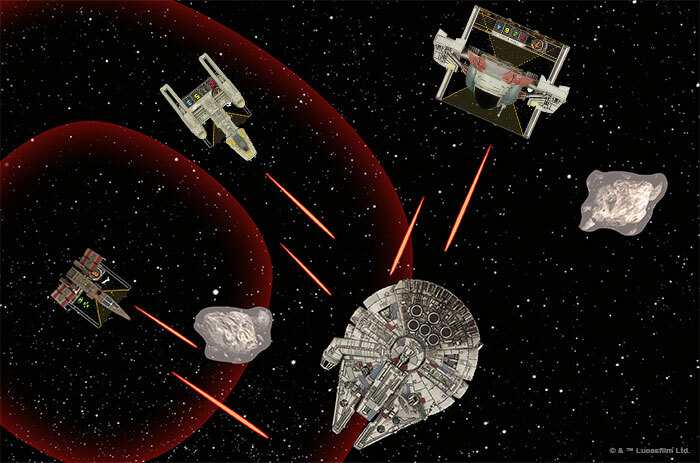 With X-Wing™, you can fly any or all of these starships. It's part of what makes the game so great. 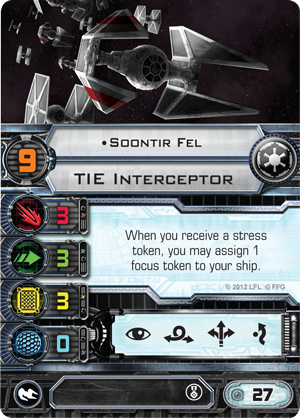 Once you break into the game's fast-paced starfighter battles via the Core Set's X-wing and TIEs, you have a whole range of starship expansions with which you can construct your expanded fleet. Add A-wings or B-wings. TIE bombers or TIE interceptors. The quadjumper or the Lambda-class shuttle. Options abound, meaning you can fly nearly anything you'd like. And you can do so with just about any of the Star Wars galaxy's most famous (or infamous) pilots at your side. But where should you start? The wide range of starship expansions you can field in X-Wing leads to tremendous squad-building freedom, but it can also prove daunting to newer players. Your resources are finite, after all, and you want to get the most from each of your purchases. 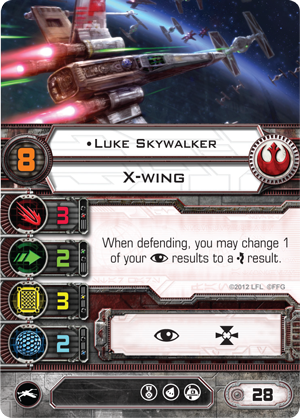 In our X-Wing 101 articles, we address these concerns by offering different points of view as to how you might expand your X-Wing collection. Each article explores one of the various paths you can take, leading you deeper into the game and toward a richer, fuller game experience—but always making sure to offer these experiences for 101 USD or less. In previous articles, we've seen introductory—and competitive—lists for Imperials and Rebels. And we've seen lists aimed at mission play. But we have, thus far, steered clear of the game's third expansion, Scum and Villainy. This owes largely to the fact that you'll find Imperial and Rebel ships in both the Classic Core Set and The Force Awakens™ Core Set, but no Scum ships. This makes it a bit trickier to design a fun and competitive Scum squad that you can assemble for less than 101 USD. 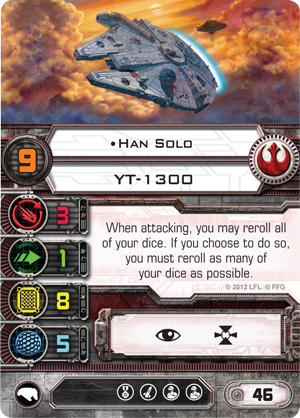 By no means, though, does this make the task impossible, and guest writer Kris Sherriff offers proof by sharing a Scum squadron that offers enough punch to hang in any fight, even while it plays hard to the faction's distinctive themes and style. 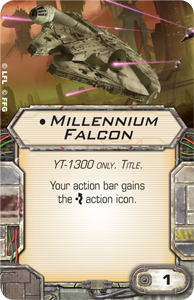 I knew when I was offered the chance to write an X-Wing 101 article that I was going to jump in at the deep end: I wanted to see if I could build a squad for the Scum and Villainy faction that would be fun to fly and viable at events whilst also having the feel of being a "Scum" squad. 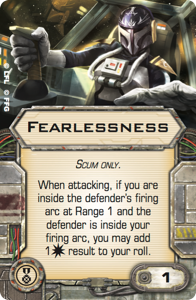 The Scum faction has a whole host of pilots and upgrades that just make you or your opponent say, “Wait… What?” or other words to that effect. Ever since the faction was introduced in Wave VI, they have done things differently. 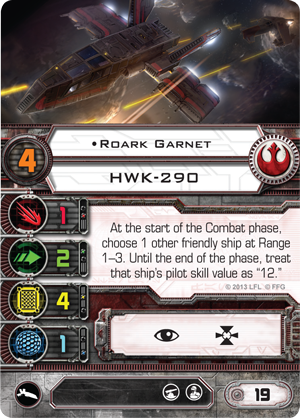 Where the Rebel faction has Roark Garnet , who can buff one of his allies to pilot skill "12," ensuring that ally shoots first (even before Han ), Scum players get Torkhil Mux , who reduces the pilot skill of an enemy to "0," for the combat phase, ensuring that his entire squad gets to shoot before the unfortunate victim. 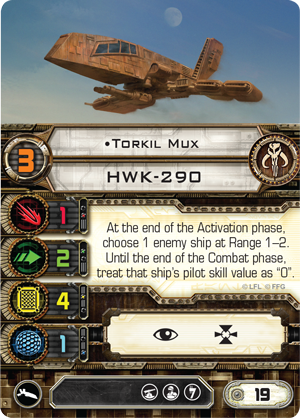 When he catches the Falcon within Range 1–2, Torkhil Mux can reduce Han Solo's pilot skill to "0" for the combat phase, making it possible for both his wingmates to shoot before Han has the chance. 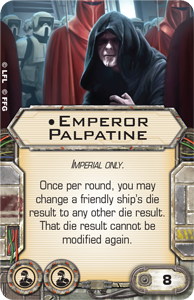 And where the Empire gets Emperor Palpatine to alter fate in favor of the faction's fragile aces, boosting their survival in combat, the Scum faction gets to watch Prince Xizor pass his damage to nearby allies, who can then go on to set off huge chain reactions of exploding Z-95s, using illicit upgrades like Dead Man’s Switch . These are the sort of things that make you say, "Wait… What?" And embracing this playstyle, I went to work. Now, the "Wait… What?” moment with this ship comes from the inclusion of Punishing One on the pilot skill "3" Contracted Scout. I have lost track of the number of times, after going over the list before a game, that my Opponent has asked why I am rolling three dice with my attacks. 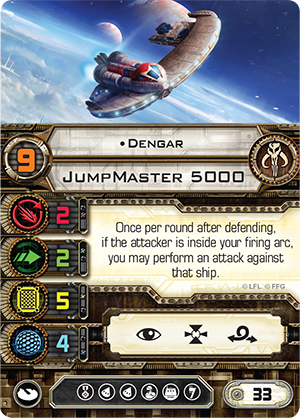 Not only is it a solid attack, but it's highly-modified because of the Dengar crew and focus action, and having it come late in the round forces your opponent into a lot of choices. Finally, the Contracted Scout's Feedback Array lets you perform blocking moves and still apply damage to the enemy it blocks. This means your opponent needs to worry about both the area your Scout can occupy and the potential damage it can deal to any target in range. 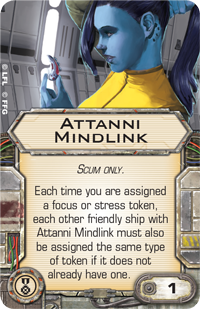 The more observant of you may have already noticed the inclusion of Attanni Mindlink on the Scout and started jumping ahead to the other expansions I decided to bring into my build. 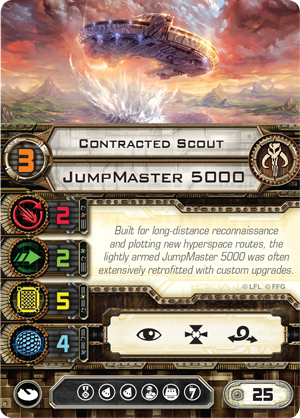 Attanni Mindlink has become a staple of many Scum and Villainy squads due to the tremendous amount of action economy it offers, and the fact that you get two copies in the JumpMaster 5000 box went a long way toward forming this squad. 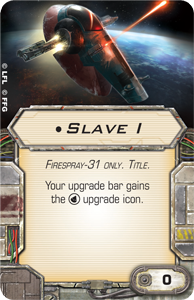 For the second part of this list, we went to the Protectorate Starfighter Expansion Pack and the Mandalorian ace, Fenn Rau . 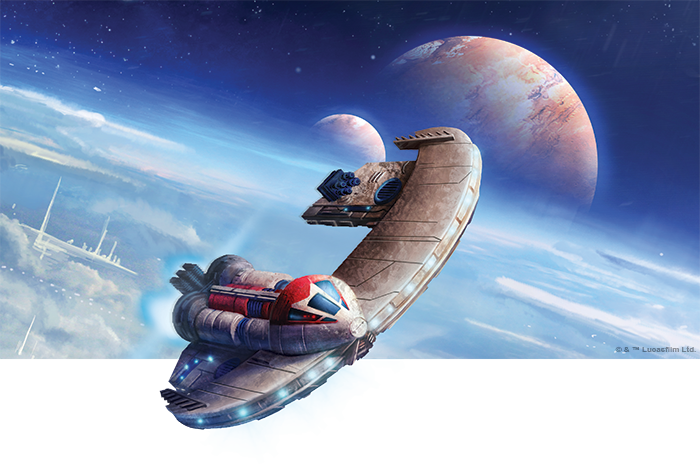 The Protectorate Starfighter Expansion Pack is a really nice self-contained pack that offers a swath of pilots that all fly a little differently. In this list I wanted to add in a little more punch, and that is where Fenn Rau fits perfectly. 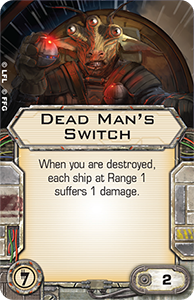 His ability to add an additional attack die at Range "1" can lead to some devastating attacks and plays into the idea that we want to control where your opponents are going to position their ships. Knowing that the Contracted Scout will move early for blocks cuts down the options, and having Fenn Rau move late in the turn allows you to limit any uncertainty concerning your opponents' moves. Fenn Rau's high pilot skill gives him the ability to react to his opponent's maneuvers. In this example, he performs a barrel roll to get the best of a Rookie Pilot . Now with The Force Awakens™ Core Set, Punishing One Expansion Pack, and Protectorate Starfighter Expansion Pack, I was getting close to my budget, but I still wanted and needed a few things for my list. 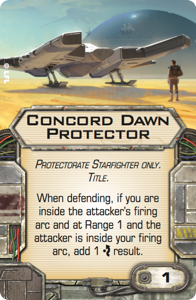 After I gave Fenn Mindlink and the Concord Dawn Protector Title, I wanted a ship that could contribute enough to the damage output to be considered a threat amongst the company of the Contracted Scout and Fenn, but that wouldn't necessarily be the easy priority. With that in mind, the choice to pick up an M-3A Interceptor Expansion Pack was a relatively easy one. 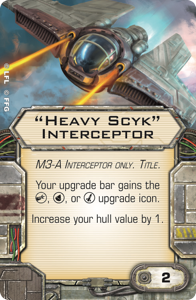 The recent update to the "Heavy Scyk" Interceptor Title gives the ship an extra hull point for the bargain price of two squad points, plus access to the cannon, missile, or torpedo slot. 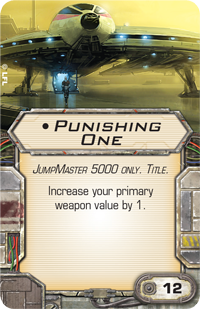 With the errata, that would have been reason enough, but the fact that Stealth Device comes in the expansion really pushed me over the edge toward making it my final selection. The choice between Autothrusters and Stealth Device on Fenn Rau is one that I enjoy agonizing over whenever I make a list. 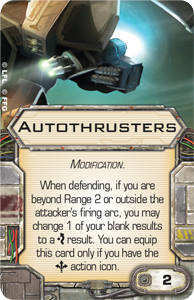 Autothrusters has introduced a level of arc and range control to the game that I find extremely enjoyable, and it leads to really rewarding play when you can use it correctly. 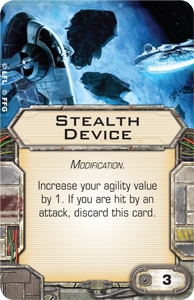 But as I wanted to stick to my “Wait… What?” style for this list, Stealth Device was the clear choice. My argument for Stealth Device in this list is that it encourages Fenn to be bold and aggressive. 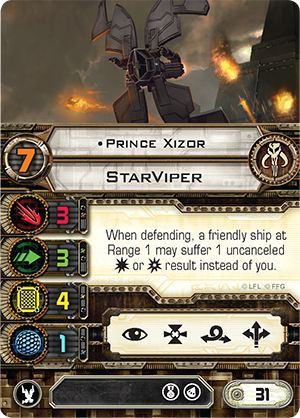 He needs to be in the fight throwing out damage, and the more cagey playstyle encouraged by Autothrusters is—in my opinion—better left to pilots like Soontir Fel or Poe Dameron. 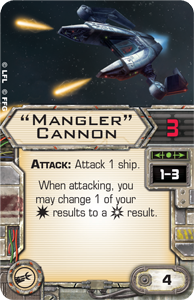 Autothrusters can mitigate a lot of damage over the course of a game if you stay out of the firing arcs of ships with turrets or hold back at Range "3," but without the ability to evade, Fenn still leaves you susceptible to bad rolls. And if you get slowly worn down at range "2" and "3," Fenn Rau is not doing his job. Mandalorians face their enemies head-on. That’s where Stealth Device helps. Going head-to-head with Fenn can be scary, but he will be rolling five defense dice at Range "1," and when the Title triggers, he adds yet another evade result. Furthermore, since he can have double-stacked focus tokens thanks to Attanni Mindlink, he can spend one offensively and still have one for his defense. 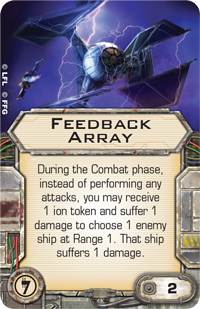 Meanwhile, your opponent will have to choose whether to spend tokens on offense (if they shoot first) or to save their tokens to spend defending against Fenn Rau’s five modified attack dice. 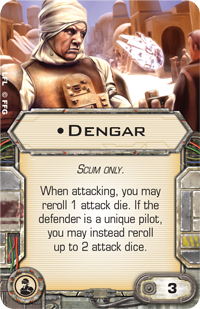 Meanwhile, you still have the lurking threat of the Contracted Scout at the helm of the Punishing One, firing three dice later with Dengar and a focus token to modify them. The final question left to me was how best to build the M-3A interceptor to contribute to the list. A few options came to me. One option was to take Serissu to add to Fenn’s survivability with the re-rolls she grants, but she felt kind of toothless and was a little bit too gimmicky. I always advise people not to chase a gimmick too far; enjoy the benefits when you can, but accept that your gimmicks won't always work. And in this case, spending twenty squad points to try to hold onto Fenn’s Stealth Device felt like I was trying too hard. 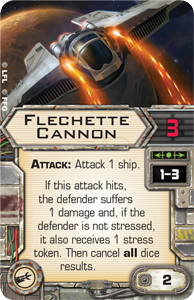 Another idea was to add a little bit of control with stress from the Flechette Cannon , but the drop in damage was a little too high for the list. Maybe if I had paired Fenn with a torpedo build on the Contracted Scout, the alpha strike would have made up for the lost damage, but I wanted something a little more consistent. In the end, I went with a Tansarii Point Veteran . 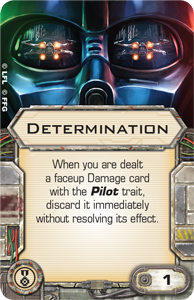 Originally, I had planned to leave the elite pilot talent slot empty for a 1 point initiative bid for Fenn Rau. Although I think this is a viable option, I am comfortable enough with flying Fenn that I wouldn't find it too much of an issue if he has to move before other pilot skill "9" ships. The idea behind Fearlessness, then, is that it lends an extra threat to the list above and beyond the normal—and not inconsequential—threat of a Mangler "Scyk." Adding a hit result at Range "1" that you can then flip to a critical hit with the Mangler effect makes the Tansarii Point Veteran a rather high priority target. And that's what we want—to draw the heat off Fenn. If you can make the Vet and Fenn dive buddies and fly them both into Range "1" of your opponent, in arc, your opponent is almost certainty going to take the shot at the Tansarii Point Veteran. It is almost as deadly a threat and is far easier to hit. If this choice means that Fenn lives to the end game, then all the better! 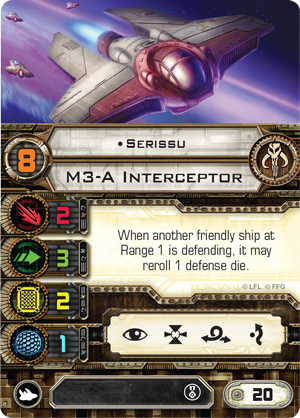 And at the same time, the M3-A interceptor gives us the evade action and three defense dice. Add its four total points of shield and hull, and the Vet is not an easy ship to one-shot. I didn't use an X-wing or TIE fighters, but I still needed a Core Set for the rocks, tokens, range ruler, dice, and damage deck. 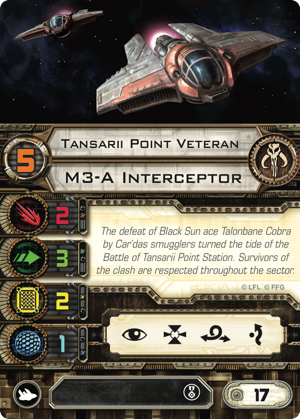 And while I did toy with the idea of Mindlink on the Tansarii Point Veteran and Determination on the Contracted Scout, I much prefer the new damage deck to the old one. The access to the smaller rocks also played a big part. I like the smaller rocks as they allow you to build a tight asteroid field, but one that takes up a comparatively small space on the table. By placing the smaller asteroids from The Force Awakens Core Set close to your opponent's obstacles, you can create an asteroid field that's tucked tight into a corner of the map. 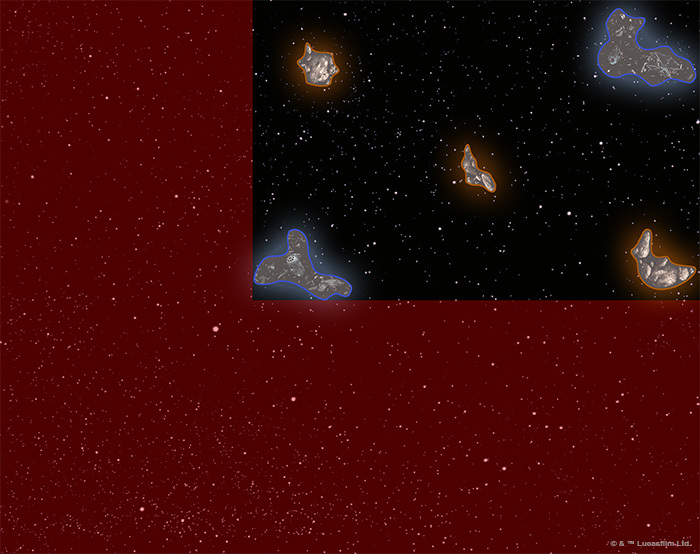 Here we see a sample field that's taken shape just outside the range "2" restrictions of the map's lower-left corner. The new asteroids also have the more interesting shapes, and I went with the infamous "mustache" rock, the "almost looks like an apple" rock, and my personal favorite—the L-shaped rock. You can get some really interesting placements with these rocks. And with a little practice, especially with the L-shaped rock, you can block some annoying rock placements for your JumpMaster 5000 while leaving more than enough space to bank turn in from the right-hand edge of the table—every JumpMaster's edge of choice. That rounds out the list and comes in just under my theoretical budget with The Force Awakens Core Set, Punishing One Expansion Pack, Protectorate Starfighter Expansion Pack, and M3-A Interceptor Expansion Pack. It also leads me to a squad that I have now played in multiple games and is so much fun and offers enough competitiveness that, in fact, I decided to fly it at Worlds! Kris has been playing X-Wing since Wave I and shares his unique analysis of the game's newest and most interesting squadrons on his YouTube channel, DiceHate.